After its unprecedented success in Dubai, Al Habtoor Group’s most successful fast fit servicing concept SpeedFit Clinic has now arrived in Ras Al Khaimah. The residents of Ras Al Khaimah will now have the convenience of having their vehicles serviced while they shop at RAK Mall. 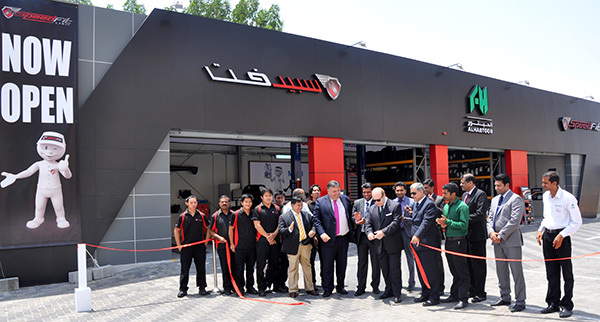 The state-of-the-art facility was officially inaugurated by Mr. Karl Hamer, Managing Director of Al Habtoor Motors, Mr. Hussain K Jamal, Manager of RAK Mall and Neil Coolledge, General Manager of SpeedFit. Apart from standalone services, customers can opt for the comprehensive Gold Service Package for AED 96 which includes all fluid top ups & vehicle health check with oil change. The Clinic also offers a Platinum Service Package with many more additional benefits for AED 96 net. “The hallmark of SpeedFit Clinic is that customers do not have to take any prior appointments and can have the advantage of convenient working hours. Furthermore, the centre’s ‘While-U-Wait’ service ensures a quick turnaround time where vehicles are ready in less than one and half hours. To maintain the highest standards of quality in all aspects of vehicle service and repair, SpeedFit has tie ups with leading tire companies, oil giant Mobil, the number one battery brand Energizer® as well as original equipped spare parts from Global Auto Parts.” Mr. Neil added. SpeedFit Clinic offers cutting edge, one-stop shop, value for money service and repair experience for owners of all makes and models of passenger cars, SUV’s and light commercial vehicles. SpeedFit Clinic customers can avail a wide range of vehicle services which include tires, brakes, lubricants, oil, batteries, steering, suspension, air conditioning, exhaust and car servicing. In addition to this, SpeedFit Clinic offers a wide choice of leading tire brands from around the world. The centre also offers fitting, balancing and computerized wheel alignment services. One of the leading business conglomerates in the UAE, the Al Habtoor Group has made a major investment in creating SpeedFit. With an impressive blue-print of 42 locations throughout the Gulf region, the group aims to make SpeedFit the leading fast-fit company in the Middle East, and has plans to expand its network to Saudi Arabia, Qatar, Kuwait and Bahrain.